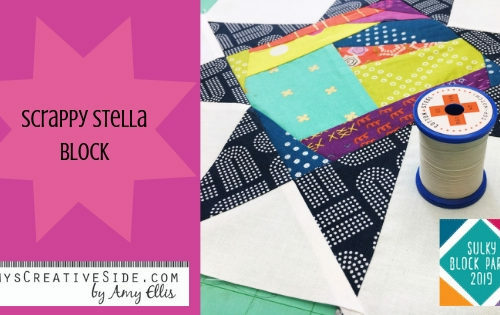 This matchstick quilt block is named as such because of the matchstick quilting it features, which really calls attention to the brightly colored thread used on a neutral background. Matchstick quilting is basically straight line quilting but a bit wonky. 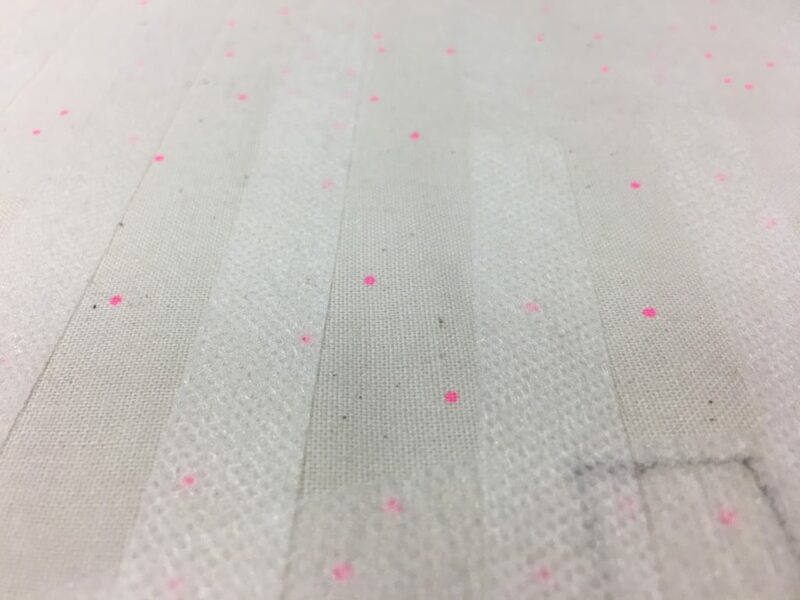 The stitching lines are placed about a matchstick-length apart, and just like a burned matchstick, the lines aren’t perfectly straight. 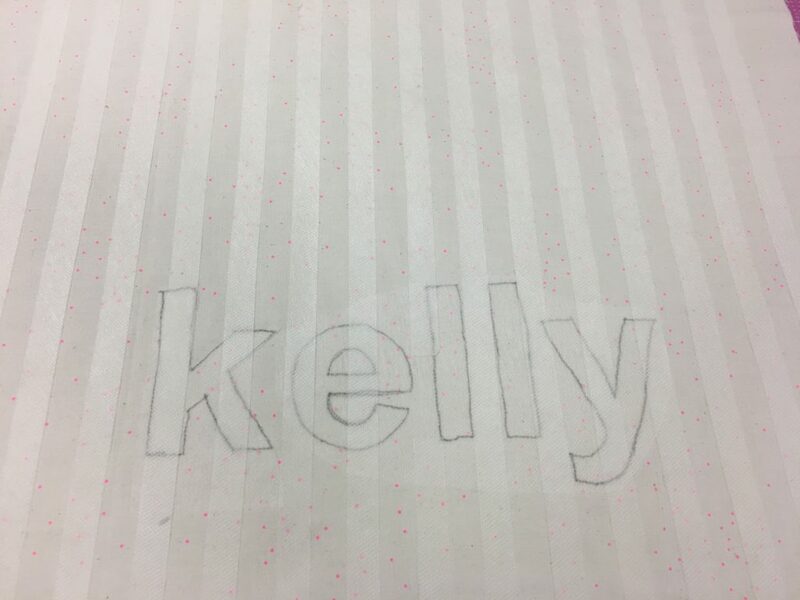 For this quilt block, we’ll take matchstick quilting one step beyond and use the negative space in the quilting to spell out a name. This process is easy with Sulky Stick ‘n Stitch. 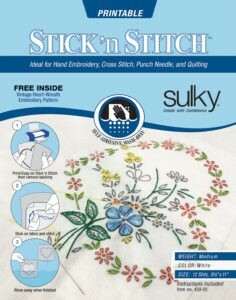 Stick ‘n Stitch is a water soluble sticky back stabilizer that is a great tool for straight line quilting. Cut the Stick ‘n Stitch into 1/2″ strips to first act as stitching placement lines. 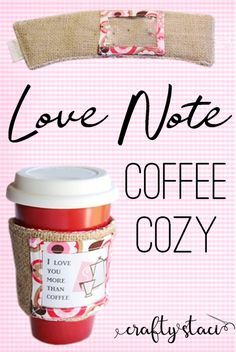 Also print the name onto Stick ‘n Stitch to ensure you won’t stitch into the space that’s reserved for the name. 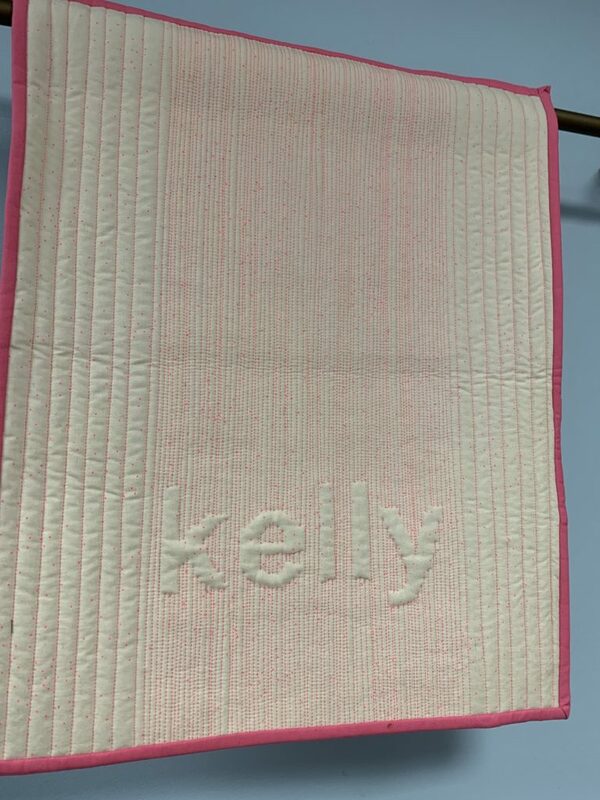 Stick each strip and the name onto the quilt surface where desired, placing the strips 1/2″ apart. 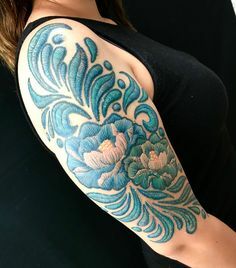 Begin by stitching along the outer edges of each strip of Stick ‘n Stitch, starting and stopping at the name upper and lower edges, in some cases along the sides, to leave the negative space of the name free. 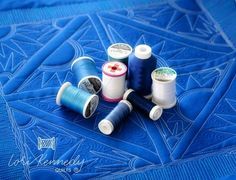 Sulky rayon thread is a great choice for quilting that you want to shine, figuratively and literally! 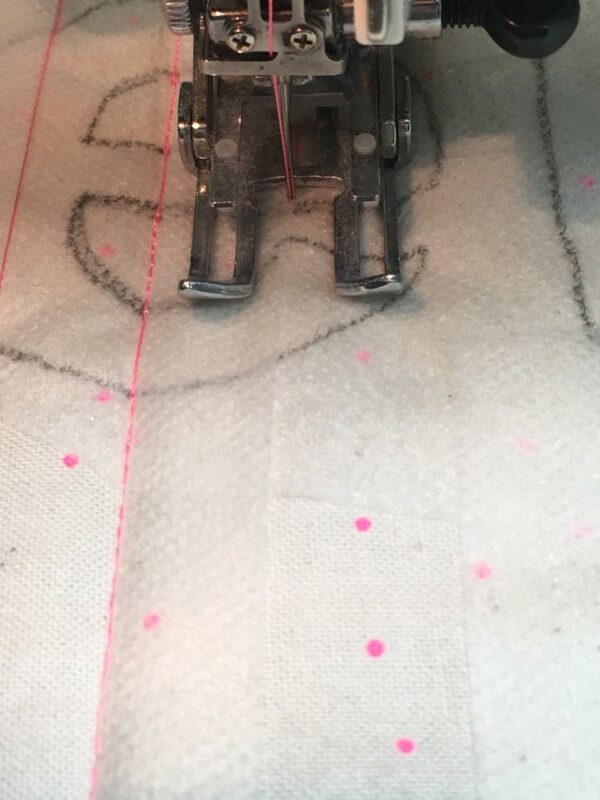 Keep stitching lines inside of the placement lines you created, leaving the Stick ‘n Stitch intact. It will act as a stabilizer as well as a placement tool. 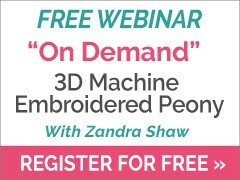 Take a small backstitch when starting and stopping to anchor the thread; or, engage the auto function for this on your machine if applicable. 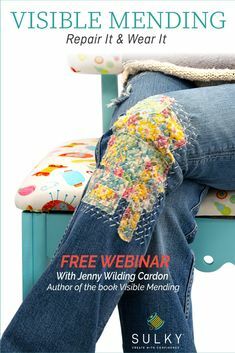 Instead of clipping the thread ends at each start/stop, continue stitching and leave the thread intact until after the block is complete. Then trim the thread tails close to the anchoring stitches. Rinse the quilt under a faucet to remove the Stick ‘n Stitch. Or place the quilt i the washing machine to dissolve the product. 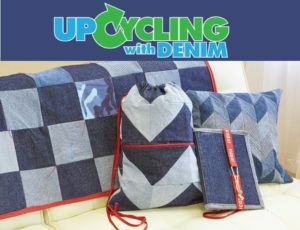 Let the quilt dry and marvel at your handiwork! 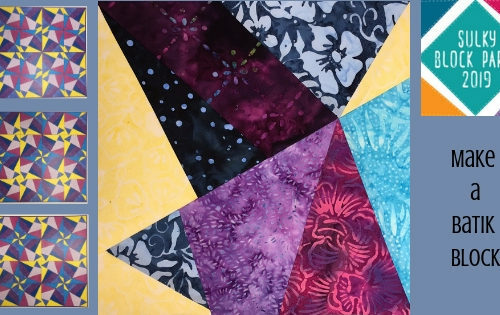 Turn the block into a small wallhanging for your sewing studio, or use the same technique on numerous blocks in a large quilt. Whiskers, I usually stitch tope to bottom on one line, and then reverse. If I am doing this one a large quilt, I use Sulky KK2000 to spray baste and pin so the fabric doesn’t move under the presser foot. 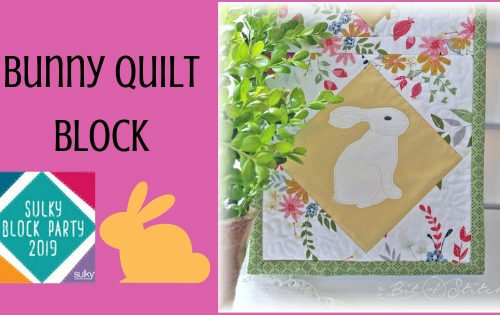 I hope you will try Matchstick quilting! 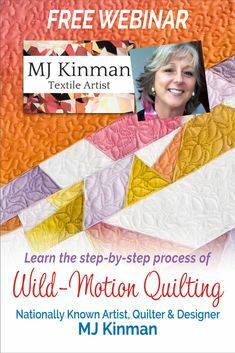 It is really fun and gives the quilt another dimension which I love.